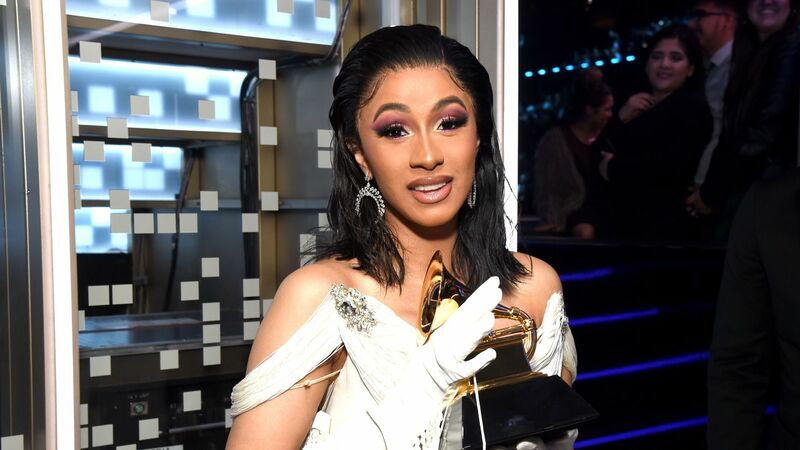 After a whirlwind breakout year and even greater success to begin her 2019, Cardi B can add the Recording Academy’s Best Rap Album to her list of legendary achievements. The record-breaking rapper took the stage at the 61st Grammy Awards with Offset by her side in utter amazement and accepted her accolade for her album Invasion of Privacy. She beat out Mac Miller‘s Swimming, Pusha-T‘s Daytona, Travis Scott‘s Astroworld, and Nipsey Hussle‘s Victory Lap. From the second that Cardi stepped onto the stage to accept the award, she was a mess of nerves and tears. It took the steely calm smirk of Offset to help Cardi regain her composure as she worked to find the words to properly explain her feelings. “Babe I can’t breathe,” she began, blinking back tears. “Oh, the nerves are so bad,” she said between gasps. “Maybe I need to start smoking weed.” The crowd erupted into laughter. Of the laundry list of people that she went on to thank, her heartfelt mention of her daughter, Kulture, was the centerpiece of the moment, acknowledging her impending presence when she was pregnant as the catalyst of the inspiration to finish Invasion of Privacy. Cardi left the stage much calmer than before and content with her words. Cardi was definitely out of breath from her mesmerizing and adventurous performance of “Money” earlier tonight. If she was on her way to regaining her energy following her musical number and acceptance speech, she might fall out again when she realizes that she’s the first female solo artist to win the Best Rap Album Grammy in history. Give this woman her crown already.